Great question - I think there are two misconceptions in your question that are interfering with your understanding. First, crossing-over occurring at just the "tips" is just for clarity in textbooks so you can easily follow the different pieces of chromosome. Although crossover events tend to occur at particular sequences, these don't have to be at the tips. There can also be multiple crossovers on the same chromosome, or none at all. See this link for some estimates of recombination rates for different species. Second, gamete diversity doesn't depend only on crossing-over during meiosis, it also depends on the incorporation of just a single chromosome from each pair. Humans, for example, have 23 pairs of chromosomes. There are therefore 2^23 = 8388608 different combinations of chromosomes - with NO crossing over! Therefore, even without recombination, the odds of two genetically identical sperm fertilizing two genetically identical eggs are incredibly small. "there will be two cells that will be almost opposites (for each chromosome, if one cell has the mother's chromosome, then the other will have the father's chromosome), except for the parts where crossing-over happened"
It seems to me; you're missing something. 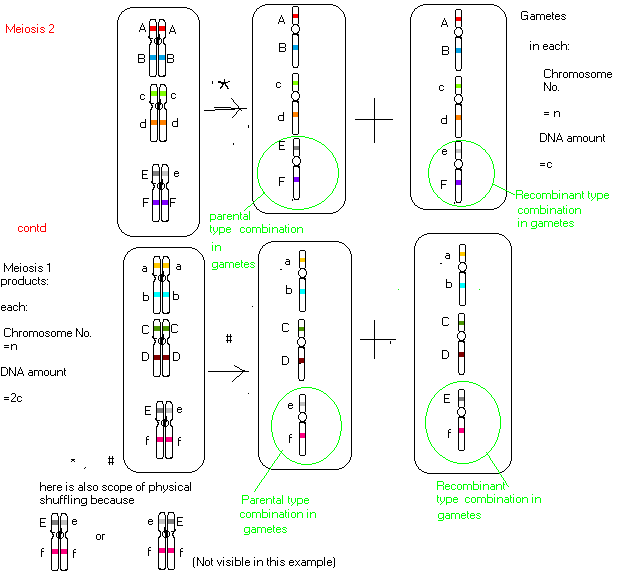 It would happen if the haploid chromosome number n=1 and no crossingover is there. 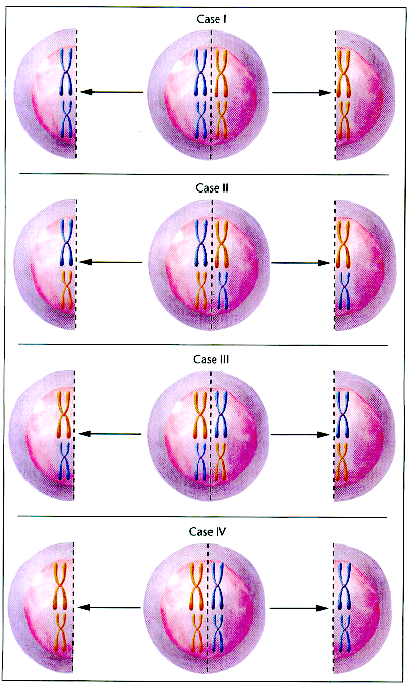 then at segregation event in meiosis-1 ; any-1 of 2 homologous chromosomes will go to a doughter cell; in a probabilistic manner (and this assortment is independent from other chromosome-pairs). Take example. If all your somatic cells have a chromosome composition Aa Bb Cc (where with each letters I meant a chromosome and not gene); then perhaps you are thinking it could be seggregated only into ABC + abc. But that is not the case. In one cell at certain place at site of meiosis, it would be Abc + aBC; in some other cell it would be AbC + aBc; and somewhere else it would ABc + abC, and that way. So ultimately you get not 2 but many more types of gametes. Here is 2 simple drawings. The book, Concepts of Genetics by Klug, Cummings and Spencer, 8th edition (the ebook I have), chapter 2 (mitosis and meiosis); clearly mentions the random-assortment (physical shuffle) event with examples. here is a picture from that book. diagram from Klug et al. Not the answer you're looking for? Browse other questions tagged genetics dna reproduction meiosis gamete or ask your own question. Why isn't meiosis II called mitosis (as the chromosome number doesn't half)? What does the nucleus look like in S phase of Meiosis?